The Bone Morphogenetic Protein 4 (BMP4) is identified to play a significant role in cardiac remodelling; gene polymorphism and its resulting associations with Left Ventricular Hypertrophy (LVH) in diabetic Chronic Kidney Disease (CKD) patients of this protein are yet to be established. 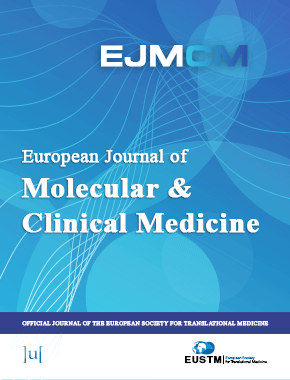 To analyse the association between BMP4 gene polymorphism and LVH in diabetic CKD patients. Isolation of DNA from whole blood samples of 50 patients each; patients diagnosed LVH with diabetic CKD and also from LVH patients without diabetic CKD, diabetic CKD without LVH and also normal patients as control were extracted. The gene of interest (BMP4 gene) purified from various samples digested using zero-cutter restriction endonucleases (Hind III and Bam HI) by employing the Restriction Fragment Length Polymorphism (RFLP) technique. The restriction has been analysed using 1% agarose gel Electrophoresis. The gene from patient having LVH without diabetic CKD when digested with Hind III showed fragmentation, more specifically, it presented three/four fragments which were at a comparable distance corresponding with the following size reference markers at 2000 bp(few cases), 1500 bp, between 700–600 bp and the last one near 100 bp. This fragmentation pattern was repeated identically for the gene from blood sample of patient having LVH with diabetic CKD which was also digested with Hind III. A similar fragmentation was not visualized for sample from patient having diabetic CKD without LVH when digested with Hind III. But no such fragments were noted for the samples from the same patients when digested with Bam HI. BMP4 gene polymorphism has been confirmed in patients having LVH regardless of the presence or absence of diabetic CKD along with it.